Full Spectrum, Highest Potency Natural Antimicrobial. Silver Excelsior Serum can change your life! Many times more powerful than the popular colloidal silver, this serum uses chelated silver to create a natural antibiotic that can kill more than 600 varieties of bad bacteria, while leaving the good bacteria intact. That means, no worrying about antibiotic resistant superbugs, new gut health issues, or the toxicity that comes with pharmaceutical antibiotics. Why Silver Excelsior Serum? Formulated as extremely potent bioparticles, Silver Excelsior Serum works hand in hand with your body’s cell structure. The buzz is that it repels influenza, stomach bugs, and more than 660 known types of pathogenic bacteria. Each bottle of Silver Excelsior contains about 660 drops – and a single drop creates 1 oz. of highly potent chelated silver ions. Chelated Silver: A Biologically Superior Form Of Silver Most silver healing solutions can’t fully bond to living tissue, limiting their bacteria-killing capabilities. The chelation process attaches silver molecules to amino acid molecules (chelators). These chelators are then able to bring the silver into the body so that each particle of silver can come in contact with the infected area. 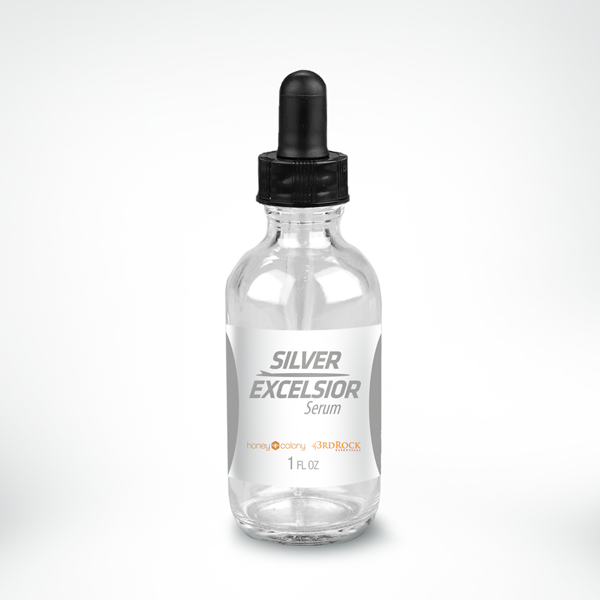 Therefore, each drop of silver excelsior serum is hundreds of times more potent than other forms of silver. "Product seems to be working good so far as I use it as a natural antibiotic – for pink eye, ear infections, to prevent colds/ cases of flu, etc. I am happy to have found this Naturally Sourced Silver Excelsior Serum as it is a great brand, reasonably priced and very effective. Everyone should have a bottle of this amazing product at home as it helps boost the immune system!" "This silver excelsior serum came at the perfect time, when my health started to crash with this crazy change of the temperatures every week. For the last two weeks I felt as if I was trying to fight with my health. I felt down as if I had no energy and my eye, throat and chest hurt. I was taking my regular vitamins and trying to get some rest but I could not shake it. When this arrived I felt like my immune system has boosted up. I immediately took the serum and I can honestly say the next day I felt so much better..."
"I have loved Silver Excelsior Serum since I recently purchased it. I initially bought it to try to treat an ongoing sinus infection, and it has worked wonders for me! I don’t think there’s anything like this on the market, for a start it even looks beautiful, but it is well worth the purchase, it has done wonders for me and I’d happily recommend it to anybody!" Silver Excelsior Serum’s antimicrobial action Silver and silver oxide have a unique antimicrobial action. Silver attaches to the bacteria cell and blocks respiration, causing it to die. It works so well in killing pathogens (but allowing good bacteria to flourish) that even mainstream physicians use it. Silver compounds are used to prevent infection in burn patients Silver ions are used to treat sunburn. Silver is used in airline filters to prevent spread of a variety of bacterial diseases. Can NOT cause resistance You’ve heard that bacteria such as MRSA is mutating and becoming resistant to the most powerful antibiotics? Professor David Avnir says, “Silver isn’t vulnerable to the same pitfalls as antibiotics. Silver chemically disrupts pathogenic bacteria’s ability to produce cells, but remains impervious to resistance.” Suggested Use: Use a full dropper (fills about 3/4 of the way) in 8 ounces of any water-like liquid to make pure 100 ppm chelated silver oxide in solution. Stir gently before drinking. The hive is buzzing about the benefits of silver. Want to learn more? Visit 51 benefits of silver today! More reasons why we love Silver Excelsior Serum! One dropper full of Silver Excelsior Serum equals 40 oz of highly potent 100 ppm chelated silver solution when mixed with 8 oz of pure or distilled water. Add one full dropper (fills about 3/4 of the way) per small glass of water (8 oz) to create a 100 ppm solution. Best on empty stomach. Repeat if necessary next day. Discover how Silver Excelsior Serum can change your life! Each bottle of Silver Excelsior contains about 660 drops – and a single drop creates 1 oz. of highly potent chelated silver ions. We’ve created a three-pack of our super potent Silver Excelsior Serum for the constant battle against bacteria and infection. Save money and protect the entire family at home, on vacation, or on the road. How Much Silver Excelsior Serum Do I Need? One dropper full of Silver Excelsior Serum equals 40 oz of highly potent 100 ppm chelated silver solution when mixed with 8 oz of pure or distilled water. Fifteen drops per small glass of water (1 oz) will provide a 100 ppm solution. Best on empty stomach. Repeat if necessary next day.HoneyColony. We do not trade excellence for profit.